The most gracious book I read recently is a fictional diary: at the end of each year the writer makes a list of friends – new, old, and lost ones. I have started thinking in those terms. Last year I kept my closest friends here; also made some new acquaintances from whom I can probably learn a great deal should I manage to keep up with them (P. B.; L. B.; F. M.); I tightened my bonds with four friends who have an enormous importance for me (T. L. A.; N.d R.; N. S.; M. L.); and I weakened my bonds with a few other friends with whom I should have been more present (M. M.; M. V.; J. H.). More specifically on this last point, last year for the first time I have not spent the end of December with my Canadien‘s crew after a streak of four memorable reunions – 2011 Utrecht, 2012 Innsbruck, 2013 Florence, 2014 the Hague, 2015 Berlin. This is no good. For next year I must continue to make new acquaintances, but I also want to restore ties with some old friends. Oh fate, let it start from the Canadien family, because this is one of the most important things I have been part of since I have become a person of alleged maturity. Take up cooking again. Talk to strangers, make new friends. Keep reading books; and maybe read some poems too. Distill and trade. Spend time with Camilla and Isabella. Volunteer, much. Start and finish a Gran Fondo. Teach one more university seminar. Write three chapters for my Ph.D. dissertation. Become part of something – NGOs? cycling clubs? freemasonry? Hike with Manuel, Mindo, and Giallu. Learn something new – something practical, possibly. Try to read and practice the spiritual exercises of Ignatius. Drink whiskey with Martin and Niels. Travel outside Europe. Meet the Canadians: Iris, Joe, Jasper. Write Thomas. Avoid weddings – except Nele’s. Be present. Make a plan for life. Visit Aosta. Can happiness be haggis, neeps, and tatties? My ride took a bit longer than expected. What was initially supposed to be a short stroll with the bike away from my laptop turned into a two-month journey across four countries and very different feelings. I have, in fact, been thinking a lot about myself, for reasons both professional and personal—but then who hasn’t? It is just that there are people who tend to think about themselves it more than anybody else: generally, it is either those who have a lot of spare time, or those who tend to be egocentric. I am a bit of both. Matter of fact, I am about to speak about myself and stuff I have done – once again. First I have ridden my bike. Quite remarkably, I rode with my dad the whole way between Trento and Tuscany. Although we did not make it to Florence because of sheer lack of time, it was a good ride. We had lot of water, huge meals, and approximately 400 km down the way. My dad is still stronger than I am when it comes to long-distance ride, which is not surprising as he does not waste too much energy thinking about himself. I have also written. My articles have been published on Unimondo: some of them in Italian (Università, il dilemma dei finanziamenti privati; Mondiali in Brasile, l’importante è partecipare;Regno Unito: una lunga serie di sfortunati eventi; Mondiali in Brasile: dove è la festa? ), some others in English (How Eurosceptic is the new European Parliament? ; A new deal between the EU and Turkey on immigration rules). But I have gone international too: Iris, Jasper and all the other Orange fella will be proud as my articles have been translated in Dutch (Voor het eerst vuurwerk in Europees Parlement; EU en Turkije sluiten nieuwe overeenkomst over immigratieafspraken). I have been to the Balkans. First I went to Serbia for a volunteering program. After last year’s experience in Slovakia this year I landed in a town only 33km away from Belgrande. Lying between the rivers Sava and Kolubara, Obrenovac has been badly hit by the floods of the last Spring. I spent two weeks working with a group of international volunteers in the houses that had been damaged by the water and the mud. I then traveled south to Sarajevo, for an immersive three-day in one of Europe’s most inspiring places on the occasion of its international Film Festival. Much more should be said about this experience, but I won’t – not here, anyway. I have hiked, keeping up with the good tradition started with Manuel and Mindo. This year, after the 2012 and 2013 editions, we managed to put together the whole crew, adding Dani and Giallu, and sleeping in a comfortable refugee, Dolomiti del Brenta. In spite of what Jonas thought before we left, we never got lost, as the pictures of us looking desperately hopeless in the fog can confirm. Finally, I have read some books. While I am still trying to nail down War and Peace, I have been disappointed by Canada entertained by New Europe, and intrigued by the Consolations of the Forest. The latter is probably one of the richest, deepest, and most honest books I have ever read. Those of you who are into nature, philosophy, and vodka should probably go for it. And that’s about it. I am in Edinburgh now and will be here for a month experiencing the joy of the local cuisine, the excitement of the upcoming referendum, and the company of some old and new friends. I am planning to make a better use of the blog than the recent past. But if the days keep being as beautiful as today it won’t be easy to keep up. Questa foto non l’ho fatta con il mio telefonino. Non l’ho fatta oggi. Non l’ho fatta io. Ma rende l’idea. Three months later I finally received a few complementary pictures from our NYE reunion – the first one with Stefania, and the sixth of this kind now? What was meant to be the annual gathering of a bunch of people who met in Victoria, BC, in 2011 is now a mixed group that includes many of the new friends we met along the way. Not all of us are great ice skaters. (Hint: Iris isn’t). But, as you can see from the imagages, Jasper is. I thought the last two posts were too serious. Here is something on a slightly funnier tone. It is about movies. Believe it or not I followed your indications – I will soon post a comment on that – and I was rather impressed by the Danish movies Pernille and Jasper recommended me. The other day I was discussing it with Anders. Today he sent me the following kind message. You asked me about good Danish movies the other day. Here is a good one “The Green Butchers” about some Butchers in Denmark that end up killing people and selling the meat to people. Yeah its a dark comedy. Here you can watch the full movie with English subtitles. Being on YouTube I suppose it is legal, but of course I might be proven wrong. Until that moment comes, enjoy. 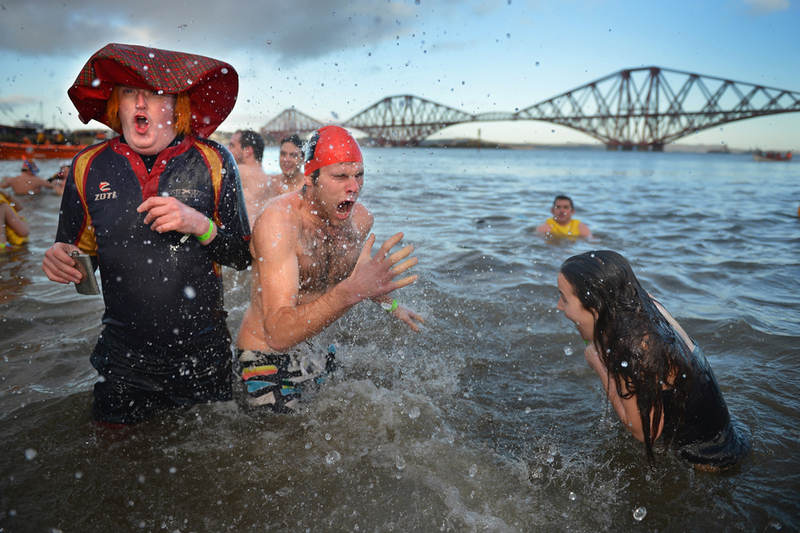 On January 1st, over 1,000 New Year swimmers braved freezing conditions in the River Forth in front of the Forth Rail Bridge during the annual Loony Dook Swim in South Queensferry, Scotland. 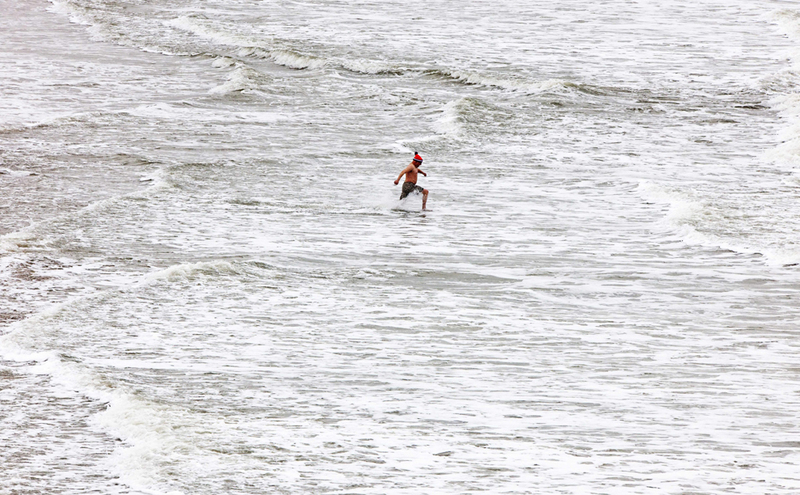 Meanwhile, in the Netherlands a lone diver was running into the North Sea for Nieuwjaarsduik. And us? This time around we were not there. And for some reasons, Jasper, Joe and I look way more relaxed in 2013. Just getting older, I guess. The first two photos are part of the 2013: Marking new year gallery of the Boston Globe. 10.15: sono su un treno che va all’Aja. Jasper mi ha convinto: lascio un decina di cadaveri a dormire nel basement mentre mi dirigo verso il Mare del Nord. Con me Jasper, Nicolas, Joe, Suzanne. 11.30: sono all’Aja. Cielo plumbeo, masse di ubriachi che si dirigono verso il mare. L’arrivo e’ sorprendente: le case si aprono improvvisamente sull’acqua, verso il grande freddo e i ghiacci perenni. Vorrei tornare a dormire. 11.45: siamo scesi nell’arena. Migliaia di persone (10.000? ), musica, stand. Tutti indossano il cappellino rosso regalato dall’organizzazione. Dovrei spogliarmi ma fa troppo freddo. 11.55: mi sono tolto due volte la giacca, ma ho sempre dovuto rimetterla. Saranno una manciata di gradi sopra lo zero. Saltiamo e balliamo tentando di scaldarci. Nicolas e’ gia’ nudo, anche Jasper (che pero’ indossa un didl tedesco al posto del costume). 11.58: penso di essere pronto. Le mie mutande di Babbo Natale mi infondono il coraggio necessario. 11.59: corriamo in acqua, so che mi aspetta una sensazione atroce: non penso più a nulla. Probabilmente i kamikaze giapponesi provavano qualcosa di simile sessant’anni fa. 12.15: sono ancora vivo. Buttarsi in acqua e’ stata una sensazione mortale; in compenso, l’uscita e’ praticamente al caldo. Siamo entrati per due volte. Attorno a me persone con la faccia sconvolta, ma felice. Ci rivestiamo faticosamente a andiamo a prendere una zuppa calda ai banchetti dell’organizzazione. 12.50: le gambe tremano ancora, ma sono sul treno verso Utrecht. 16.15: usciamo a farci un giro. Andiamo in al Cafe Olivier, ricavato all’interno di una chiesa sconsacrata. 18.30: di nuovo a casa, questa sera cena italiana. Ci mettiamo al lavoro con Marco, Teddy, Patrick e Fabio. Menu: antipasti di piadina, salame e formaggio; amatriciana; degustazioni di affettati; piadina alla nutella con shot ti Bailey’s. 20.00: la cena procede bene, c’e’ chi mangia in cucina e chi, invece (i piu’) sono accampati in giardino attorno al fuoco. 22.00: iniziamo con un massive round di shot. 23.45: ormai tutti ballano in cucina. Luci stroboscopiche, piano bar, vetri appannati: c’e’ un po’ di tutto.